Remember I told you about my friend who is recovering from surgery? Well, he has now upgraded to using a cane instead of crutches. The only problem is I laugh so hard whenever I see him walking like an old lady with a cane. (He actually got his cane from his grandmother!). So, I thought it would be much better if he could instead use a brace. Of course, before I suggest anything to him, I need to find enough information to help him make the upgrade. The more I read about knee braces, the more I was convinced this was the best solution. 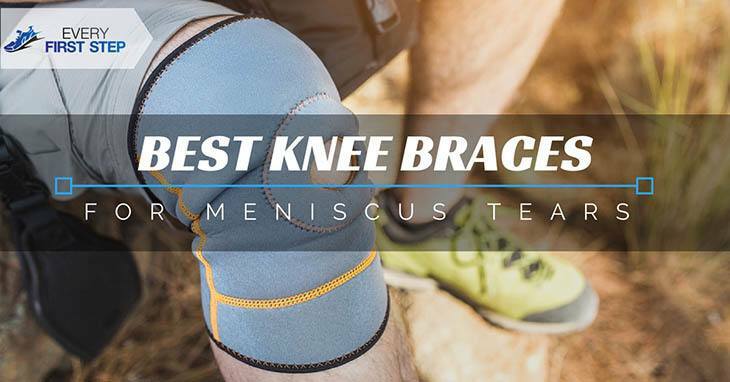 These are the top 5 best knee braces for meniscus tears. The thing that struck me about the neoprene knee brace support by compressions is that it is ergonomically designed for those who are recovering from injuries. The padding that lines the hole around the patella also impressed me because I know that would add to the comfort of the brace. The padding also makes going to the gym much easier. The brace is also adjustable which a must-have is after meniscus surgery. The lightweight nature of the brace does not interfere with its supportive nature like other braces. Having a knee brace that has a firm grip is a must and the neoprene brace support does just that. The three straps are long enough so that the Velcro doesn’t touch your skin. On the negative side, I noticed the brace has a strong odor that may take weeks to wear off. If you have large legs, the brace may not be wide enough. ​Overall, considering the price of less than 20USD, the brace is very functional if you are looking for something to wear daily. If you are looking for something that will support you in more intense activities, I would suggest the hinged knee brace by Vive. The brace has hinges on each side for extra support which are removable whenever you need less support. Another good thing about this brace is that the configuration of the straps provides adequate flexibility when bending the knee. The support provided means the brace can also be used for running. For athletes who are recovering from a torn meniscus, the brace can be worn with an elastic sleeve underneath for extra comfort. Because of the hinges, lateral movement of the knee is limited which reduces the chance of re-injury. Something I have to mention though is that the upper straps Velcro attachment don’t wrap all the way around to the fabric of the brace which may cause skin irritation. This is especially true if you have a larger leg fitting. The two first options I mentioned all ranges from $15-$20 but if you are on a tight budget, the Bracoo knee support is a good option for you. Costing less than $15, the knee support provides enough functionality while being easy on the wallet. One of the features that sets this brace apart is the enforced stabilizer ring which ensures stress is distributed equally around the tendons. It also helps the knee remain in the proper position which greatly reduces the risk of re-injury. Uniquely, the knee brace has 3 Velcro straps that you can attach wherever you wish to get the best-tailored fit and avoid slippage. If you are a sweaty person by nature ( I know I am) the perforated moisture vents around the brace help dissipate sweat throughout the day. If you have small legs, you might appreciate the size, otherwise, the braces may be too small for you. Also, I wouldn’t recommend using them over any compression pants since they slip over the soft material. If you are recovering from a serious injury that perhaps required ACL or meniscus surgery, you will be needing support for a much longer time. My friend has been on crutches for months so I believe an expensive product will be a good investment in the long run. If you feel the same, the DonJoy Bionic Fullstop knee brace might be a good choice for you. I found out that this knee brace is specifically designed to provide protection after ACL injury. It has dampening hinges which help prevent hyperextension to improve joint mechanics. Another interesting feature I found is that even soccer and basketball players can use the brace because it is designed for high-intensity activities. Something I noted was that the brace size runs small so it would be best to estimate your size generously. If you have a less serious injury and are just experiencing swelling, stiffness or inflammation, I would suggest a compression sleeve. The UFlex Athletics Knee compression sleeve is suitable for all kinds of sports activities which involve putting stress on the joints. The first thing I appreciated is that the sleeve can be used even under dress pants. Since my friend is back to work, I believe this is something he might be looking for. Unlike other compression sleeves that tend to restrict blood flow, the UFlex Athletics knee sleeve allows good movement. Another key feature of the sleeve is the silicone anti-slip wave which provides a good grip so you don't have to keep pulling it up during the day. I also noticed that the sleeve is very lightweight designed for long-term use. I also found it unique that the company sends you a brochure to show you how to properly use the sleeve along with some suggested exercises for the knee. One important thing I need to mention is some people may be allergic to the spandex or latex blend so you will need to monitor yourself in case you develop rashes. The sleeve is also not designed for high-intensity sports. The entire purpose of wearing a knee brace especially after meniscus tears is to prevent further injury. With this in mind, simply wearing a knee brace will not guarantee your recovery. You need to understand how to use them effectively. I found these 3 tips the most useful. Knee Sleeves - designed to provide knee compression to help support the knee. They also help reduce swelling and pain. Functional Knee braces - act as a substitution to damaged ligaments. They control motion and prevent re-injury. Prophylactic braces - used especially by athletes who engage in high contact sports to prevent injury. Rehabilitative/ Post-operative braces - hinged braces used for the period after surgery. They keep the knee stable while allowing for movement. Unloader braces - used to relieve pain in arthritic patients by unloading the weight and transferring it to a more stable location. Of course, it would be best to consult a professional to ensure your brace fits perfectly. But let's face it- you can't call a pro every day we want to wear a brace! So how can you ensure you find that perfect fit even if you are at home? I found a suggestion called the "two-finger" method. ​Lie on your back and invest in multiple pillows so that your leg is elevated. A pillow in between your legs is also a good idea if you have to sleep on your side. ​Try and test wearing your brace for long periods before you sleep with it. This will help you determine its level of comfort. ​Take care of the skin around your brace. Moisturize the area and let it air out for a while whenever you remove the brace. I must say there is much I never knew about braces that I have now discovered. Considering the fact that my friend is recovering from a serious injury, I would recommend the Brace Support by Compressions. The hinged knee brace by Vive is a great option if you are a serious athlete, something I cannot describe my friend as being. On the other hand, the DonJoy Bionic Fullstop knee brace is too pricey for someone who is on a budget. Lastly, the UFlex Athletics Knee compression sleeve doesn’t fit the kind of surgery he has been through. The ergonomic design of the Brace Support by Compressions is perfect for recovering from injuries. Because it is adjustable and lightweight, it will fit in with his normal daily activities nicely. On top of all that, the price is just right. Not that much of a rip-off especially since it will be his first brace but also not too cheap that its functionality is questionable. I believe this brace can change his life and speed up his recovery- I can’t wait to tell him about it. I would love to hear your thoughts about what you think is the best knee brace for meniscus tears. Please share your ideas in the comments below. Remember to share this article with others too.